The Wallace Collection is a first class art collection. While extensive, it was not created to be an academic survey of art. Rather, it is a personal collection put together by and for five individuals. It reflects their tastes and interests and so is a quite human collection. Moreover, the collection is set in a building that once was the residence of the principal contributors to the collection. While it is quite a grand house, it is still on a more human scale than the vast buildings which house the world's great survey collections. Hereford House is the home of the Wallace Collection. Built in the late 18th century by the Duke of Manchester, the lease on this house was acquired by Francis Seymour-Conway, the 2nd Marquis of Hereford, in 1792 and so the building became known as Hereford House. 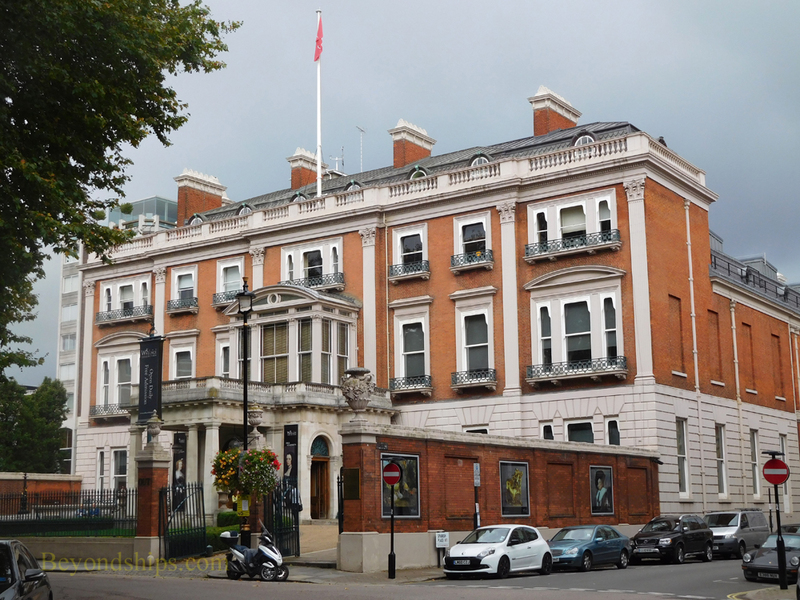 Except for brief periods when it was the Spanish and later the French embassies, Hereford House was the London residence of the Marquesses of Hereford until it was acquired by Sir Richard Wallace, who was the illegitimate son of the 4th Marquis of Hereford. Starting with the 1st Marquis, the Marquesses of Hereford were great collectors of art. Their acquisitions included Old Masters, miniatures, porcelain, arms and armor and works by contemporary artists including the great English portrait painters of the late 18th and early 19th centuries. However, the family taste ran strongly toward French works and there are numerous examples of fine French furniture as well as French paintings in the collection. Indeed, the 4th Marquis preferred to live in Paris and only used Hereford House as a place to store his growing art collection. The 4th Marquis bequeathed all of his unentailed property to Sir Richard Wallace. His title and the house passed to a second cousin. But Sir Richard, who had been his father's art adviser, purchased Hereford House from the 5th Marquis and proceeded to transform the house so as to facilitate display the collection. When he died, the collection and the house went to his wife Lady Wallace. She in turn bequeathed the collection to the nation and the government purchased the house from her heir. In 1900, the Wallace Collection opened to the public as a museum. Under the terms of Lady Wallace's bequest, it is a closed collection meaning that nothing can be added or taken away from the collection except in exceptional circumstances. Thus, the collection you see is the collection assembled by five individuals over the course of 120 years. It is a diverse collection. The paintings include works by Titian, Velazquez, Rembrandt, Murillo, Van Dyck, Hals, Turner and other masters. As noted earlier, there is a strong French influence with numerous works by Boucher and Fragonard. Baroque and Rococo furniture made for the French kings enhance the rooms. Some 300 miniatures are in the display cases. Much of the ground floor is taken up with ornate collections of arms and armor. In the small drawing room off the entrance are a number of English portraits. Although it is somewhat unfashionable now to admire such works, the portraits by Sir Thomas Lawrence are very appealing. Not only was Lawrence a master of technique but he was able to capture personality in a way that communicates the essence of this particular human being across the centuries. 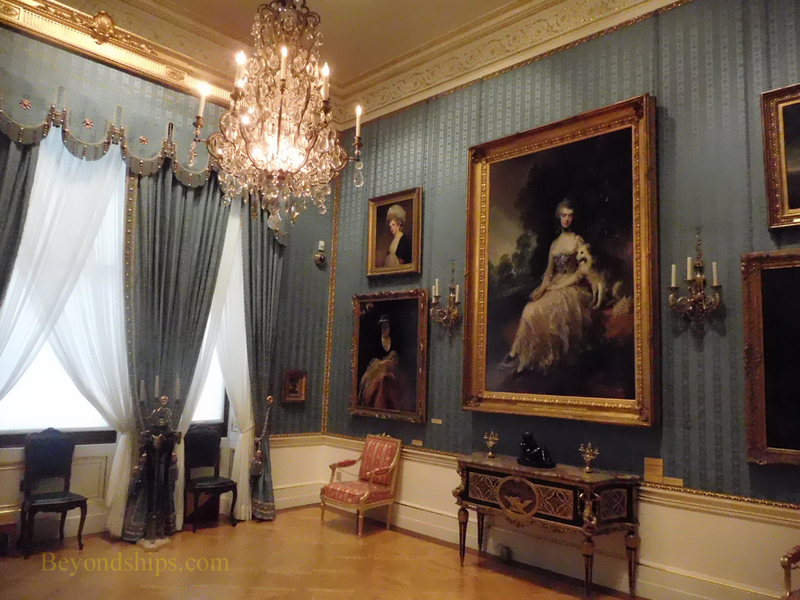 The portrait of the Countess of Blessington in this room is a good example. Several of the rooms on the ground floor are decorated as if an aristocratic family was still in residence. Most of the rooms, however, are galleries. The various rooms have been refurbished over time and in 2000 a major renovation project resulted in the addition of a restaurant in the covered courtyard. There is also a lecture theatre and an exhibition studio. Free gallery talks are offered most days including a highlights tour of the collection. For more information, see the Wallace Collection website. The Wallace Collection is located on Manchester Square, not far from Selfridge's and Oxford Street. It is open every day except 24 to 26 December. Admission is free. 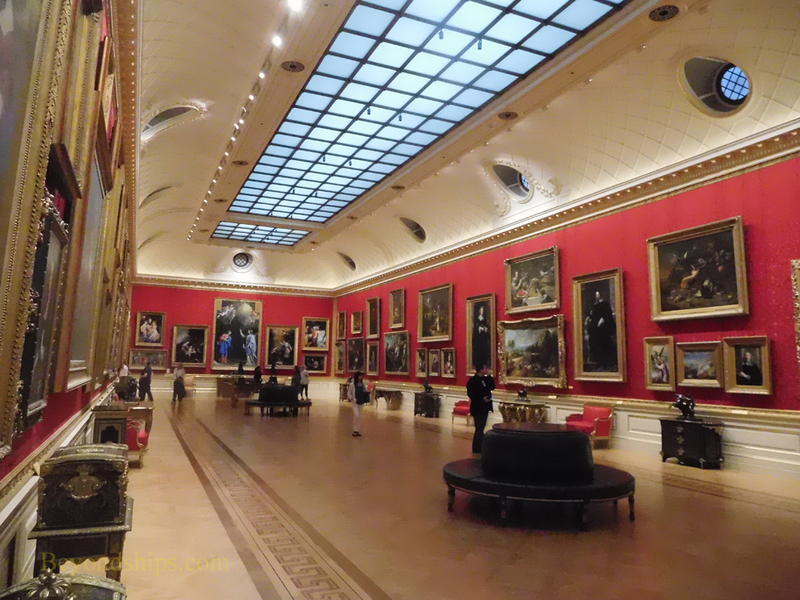 Above: The Long Gallery was created by Sir Richard Wallace to display the collection.